History was made at the most recent US Nationals held in Portland, Oregon. Teams came all across the country to compete in the event. Stakes were high, but tensions higher. Thursday started the event with Juvenile. 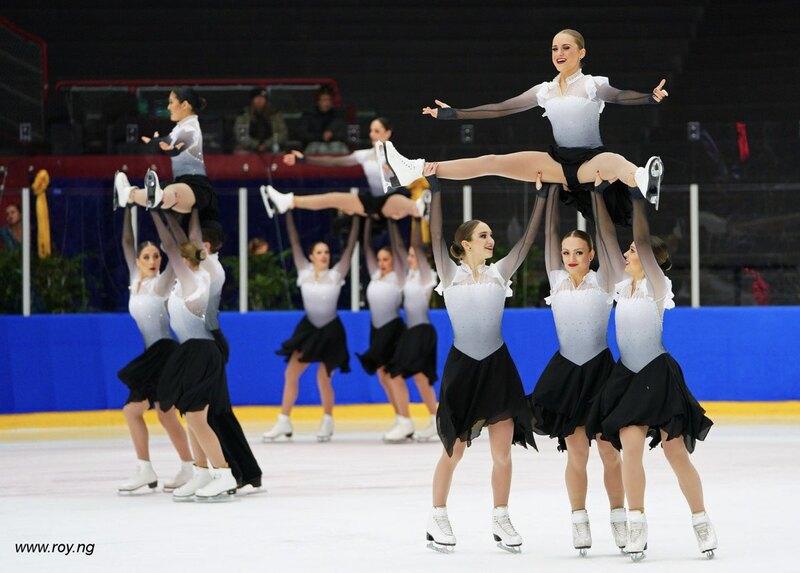 This division is especially unique since it is the youngest group of synchronized skating, and it is the future of the sport. Mini Mates from Lexington, Massachusetts and from the Hayden Skating Club led the division with a score of 48.38. Their program themed “BeetleJuice” was filled with lots of fast skating and strong elements, which made for an exciting and performed skate. Skyliners trailed closely behind with a 48.07 to “Hello Dolly.”This program was also very fun to watch and it carried a lot of maturity and speed for a juvenile team. Teams Elite claimed third with their “Nurse” program. This program had a lot of extra elements that provided lots of character, and made it fun to watch. Starlights “Cha-cha”ed their way to the pewter with their high energy skate and earned points. Following the Juvenile division was the Intermediate division. Skyliners were dethroned of their Intermediate championship and Teams Elite made history for the first time winning the championship in Teams Elite history. Their “Boxer” themed program hit the top mark and they received 69.75 points. Skyliners followed behind with their dazzling “Addams family” program with 60.28 points. 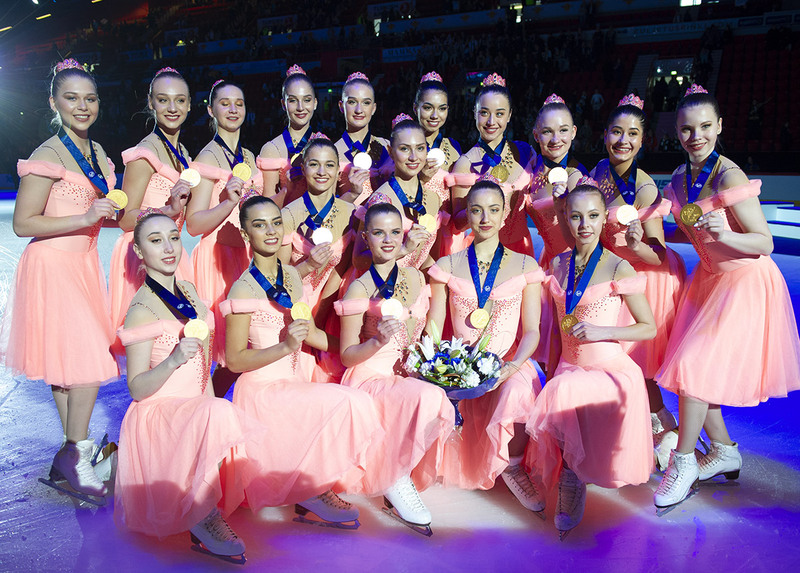 Ice Chips sophistically skated to a “growing up” themed program which led them to the bronze medal, and Team Del Sol retained their pewter medal for the second consecutive year to their “French” themed program. Junior short followed after a quick ice resurface and this was one must see event. The junior world teams had already been announced, but Nationals is always still a bloodbath. Multiple teams still want that Championship title regardless if they go to worlds this year. All of the teams had strong showings, and there was a couple of new teams to the division this year including DC Edge, Philadelphia Symmetry, Northernettes, and Team Excel. These teams were also very strong and have lots of potential for the future in the division. Skyliners skated an emotional, strong and clean program. This program was one every audience member will probably remember for the rest of their life. It was so beautifully executed, this team never fails to disappoint. Skyliners earned a 71.10 an all time Skyliners Junior high, and broke history. Lexettes skated a clean and sharp “Nashville” program. This program had lots of interpretation, placing the team in second with a 60.80. Starlights skated a strong and upbeat short to “Shakira.” This team has truly came a long way this season in terms of Starlights Junior History. Placing the team in third, they earned 57.23 points. Chicago Jazz sat in fourth with 52.29. Their dresses were as bright and hot as their themed “All Night” techno program. Hockettes places fifth with 42.45 and Fond du Lac Blades held sixth with 39.12 points. The podium was still up for grabs by any of these teams. Friday’s events started with the Novice division. This division has a more constructive age limit like the juvenile division, but competition still runs very high. Skyliners Novice became back to back National Champions with their “Phantom of the Opera” program and 72.11 points. This program carried a lot of maturity for a novice level and was very fast. Skyliners novice carries a lot of similarities to their junior team when it comes to execution and speed. Ice Mates, with their “Western” themed program skated very sharply and had lots of attack. This program had lots of interpretation which also made it feel as if you were in a rodeo with these skaters. They earned 69.03 points. A new podium placer and history maker took the bronze medal. From Yonkers, New York, Team Image claimed the bronze with a fierce “Wonder Woman” program. What's also unique about this team is they got to star in a music video with Major Lazer, and spread awareness about synchronized skating! Pewter was claimed by Teams Elite which was also history with their beautiful Lady Gaga themed program and score of 62.98 points. The top 3 at nationals were all from the east coast!! 🥈 @haydensynchro 🥉 @teamimagesynchro . Congratulations!! Senior short followed Masters, and with only 6 teams entered it was going to be a fierce competition for the selection of the World Team. The top two teams are usually selected and there was no jokes being placed in this event. Every team had a really strong skate, but it came down to the bits and pieces of the programs. 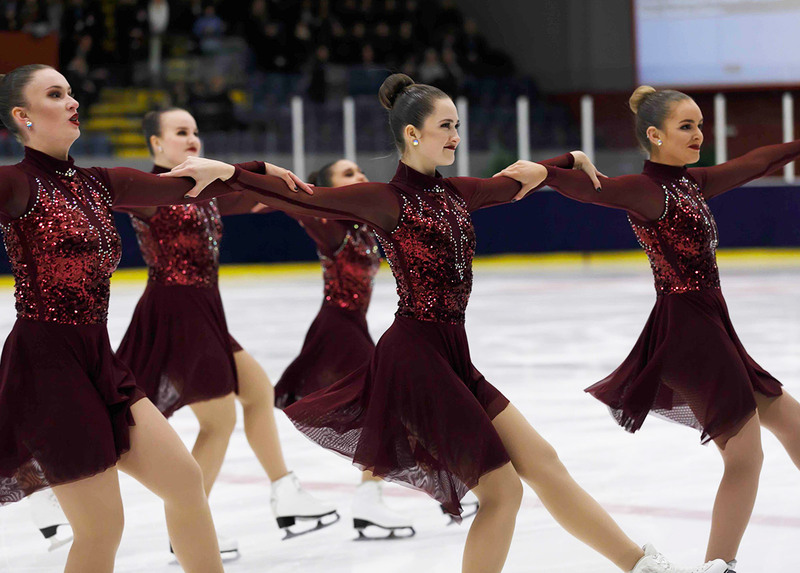 Crystallettes, last year’s Team USA 2 and National Silver medalist started the division and had a very strong skate to their themed program and earned 58.58 points this put them in fourth after short concluded. Adrian followed and also had a very strong performance with a score of 51.56. Adrian is becoming a very strong team, they had two internationals this year, and had strong showings at both. This team is not done yet, and they have a lot of potential for the years to come. Cal Gold followed and earned 43.89 points and then there was an ice resurface. The second half of senior was an absolute massacre. These three teams had strong showings all year, each placing at every competition and international. Skyliners started with their “I was Here” program. This program is very motivational and has a strong message, the team did not miss a single beat and got the crowd into it as well. They earned 66.08 and we're sitting in first. Haydenettes followed with their short program. The Haydenettes have been reigning National Champions for multiple years, and have been to Worlds consecutively. This team is no doubt, very impressive. They skated very strong and earned a high score of 73.17. Miami University followed with their techno Phantom of the Opera. Miami was clear they wanted a spot at Worlds this year and it was shown in their skate. This program was very nicely performed with lots of speed and emotion. They held the third with 64.54. The standings after with Hayden leading, Skyliners, Miami University, Crystallettes, Adrian College, and Cal Gold. Junior Long followed and this event was no playground. Teams came to finish their season strong. All the teams pushed it to the next level, and this made for one of the most exciting events of the night. Hockettes “Cher” program was skated with such sass and attitude and ended them in 6th place with a total score of 114.36. Fond du Lac Blades skated to their “Robin Hood” program with lots of attacks and it worked very well for them. This landed them the fifth place spot and some major respect. Chicago Jazz skated elegantly with their purple dresses and earned a score of and the pewter medal (139.42). Starlight’s earning the bronze and with a very strong long program. Their “Raven” themed program was very dark and eloquent. It’s truly been amazing to see how fast and how much this team has grown in the past couple of years. This gave them the bronze medal, and a future legacy for the team. Lexettes came in second with their jazzy “La La Land” program. This program is so much fun to watch and makes you want to get up and dance with them on the ice. Skyliner’s intense and sophisticated “Swan Lake” program was simply stunning. It is no wonder that they are Junior Team USA 1. Their program is filled with lots of interpretation and movements that symbolize an actual black swan. It is so amazing to watch and you can never truly take your eyes away from it. Saturday and the final day of competition started with the Adult division with Team Excel winning the division, Crystallettes receiving the silver medal, Esprit de Corps earning the bronze and DC Edge getting the pewter. Collegiate followed Adult, and this division made lots of history. One of the most epic seasons for a lot of teams in the Collegiate event. Last year’s National Champions came back ready to keep their title while Miami University and Adrian College and many teams were also hungry for the championship. This made for one of the most fierce and strong events of the whole competition. Michigan State claimed their pewter again with a score of 70.52. Miami received the bronze with a sassy “Tina” program. Miami has always been a strong contender for the podium at Nationals. They were 11 consecutive time National Champions until 2017. Adrian an underdog team came and conquered for the silver medal with a score of 84.84. This was Adrian's first national medal, and highest placement of the history of Adrian Collegiate. University of Michigan is very known for their sassy programs that provide lots of edge and speed. This year they topped off the podium and won for the second consecutive year. Their sharp “Spider” program earned them 91.48 and a start of a future legacy. Senior followed, and this division was going to be a serious battlefield. Everyone wanted that World Team spot. All the teams pushed the limit and the results were amazing. Adrian’s beautiful program about “Dreams” was skated with such sophistication, there is a large future for this team and it’s going to be so amazing to see this transformation. Crystallettes “Diversity” program speaks a message about being different, and how it’s okay. They’re dresses never fail to disamaze us, but similar to Porter there were some rhinestone malfunctions that caused some deductions. Miami University’s “Showgirls” program is very dazzling. The dresses and interpretations are so amazing. Miami performs this program like it is truly a club and it is very entertaining to watch. They ended with the bronze with a total of 182.99 points. Skyliners Senior has been coming on the radar very up and coming these past few years and this year was the year they finally made history. Skyliner’s “Cleopatra” program is beautifully skated with lots of arms, and nice extensions. The choreography and music cut is insane. They earned the silver medal and a score of 185.86. Haydenettes became 26 time National Champions and earned 204.05. 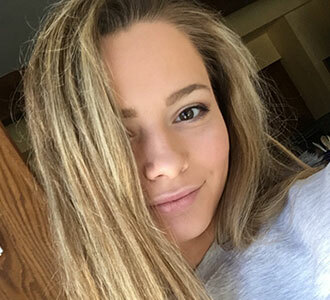 Haydenettes never fail to impress in their skating skills, execution, and speed. It was truly a treat to watch their skate.